Protesters around the country have taken to the street in opposition to the decision of millions of their fellow Americans to elect Donald Trump. While his was a fair and free election, the results are clearly unacceptable to the protesters who seem to advocate democratic choice so long as it is their choice. Hundreds of students gathered on campus to protest the results. 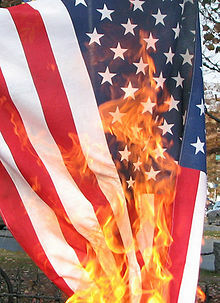 Clearly this is an exercise of free speech, including the burning of the American flag. There is a difference however between protected speech and good speech. The flag speaks to rights not results. Burning the flag is not just hateful but ignorant of its meaning. It represents the promise of democratic change in our society. There are no guarantees that you will prevail . . . only that you have the right compete. It is not clear what the protesters are demanding. They clearly want to denounce Trump but he is facially the legitimate President elect. More importantly, there is no reason to blame the system or destroy its symbol of the flag merely because your neighbors had the audacity of elect someone with whom you disagree. What are super delegates? Are they anything like the electoral college? Independent Bob – superdelegates are kingmakers. Yah, Uncle Joe is famous for his way with words. My fav was when he described Obama as being clean, bright, articulate and nice-looking.